Families who care about staying healthy are often confronted with the question of how to get kids to exercise. Having the whole family on board supporting each other is the best way to keep everyone on the same page, working together to maintain a home environment that values fitness. So how do we provide our kids with motivation to work out? Starting with a family exercise plan lets the kids know that everyone is in the same boat. Once you get the whole family to commit to a healthy plan, it’s less likely that one member of the family will resist. 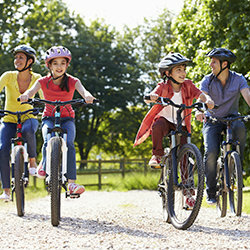 Start by explaining the value of family fitness, talk about the reasons a healthy lifestyle is important, and finish by asking kids for ideas and input on how everyone could do a better job getting more activity. Children have a different reason for working out than adults. Their main concern is fun, rather than health results, weight loss, or performance enhancement. So, when you’re thinking up clever ways to get kids to workout, think outside the box. 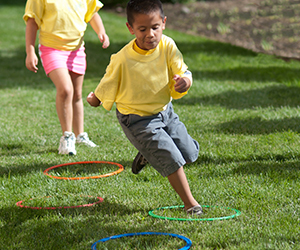 Consider fitness activities for the kids that the whole family can do together. Family yoga classes, indoor rock climbing, and swimming are just some of the fun ways kids can exercise without even realizing they are doing it. Smart phones, television, iPads, and gaming systems can sap the fitness motivation right out of kids. Deciding whether technology has a place in your home is a personal decision, but limiting the amount of screen time kids get is an important step in helping them to discover the myriad of more healthy, physical ways they could be enjoying their time. Integrating fitness technology to help motivate kids, on the other hand, can allow you to utilize the power of technology, and still keep sedentary behavior to a minimum. Leapfrog, iBitz, and Sqord are a few companies making fitness fun by offering activity trackers for kids. A fun new tech toy might be just the workout inspiration they need! Working out with your family in the Sacramento area has never been easier. Get everyone on the same page, come up with some fun fitness ideas that appeal to kids, and use technology to your advantage. Before you know it, the kids will be the ones leading the charge to a healthier, fitter family.